Ever since Jacques Plante first slipped on his iconic mask in 1959, the headwear of NHL goalies has been a topic of much debate. Over the years, critics have described these colorful designs as everything from glorious to garish (Cam Ward’s Nickelback tribute mask comes to mind), but there is one thing that most agree on: a proper goalie mask gives fans a glimpse into the psyche of the goalie himself. Goaltenders often bear this in mind when having their masks painted, and choose to immortalize those who have helped them to get where they are. This can be a family member, a favorite athlete, or simply a person who embodies sought-after qualities, such as perseverance and bravery. Such is the case in Ottawa, where Senators goaltender Andrew Hammond will honor local hero, "butterfly child" Jonathan Pitre with a subtle butterfly design this season. Meanwhile, just down the 401, Maple Leafs goaltender Jonathan Bernier is preparing to honour a hero of his own, with a brand new mask that will showcase the men that inspired him to get into the game of hockey. 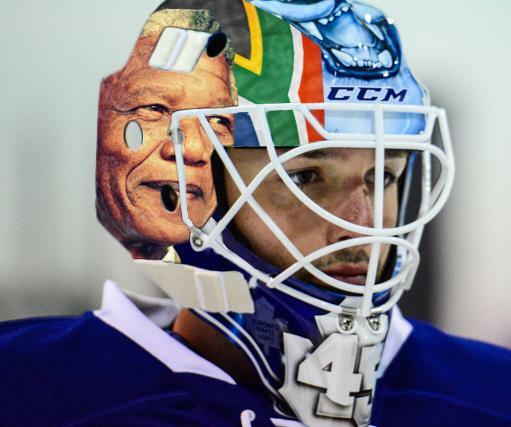 As Bernier said in an interview last year, "[Nelson Mandela] is one of the most known athletes in the world. Everyone knows him from being the type of person he was off the ice and on the ice." But Bernier isn’t stopping there. While meeting with the media this week, the young goaltender suggested that he might be looking to double-down... "I’ve seen the mask. She's a beauty. There's still some room on 'er though. 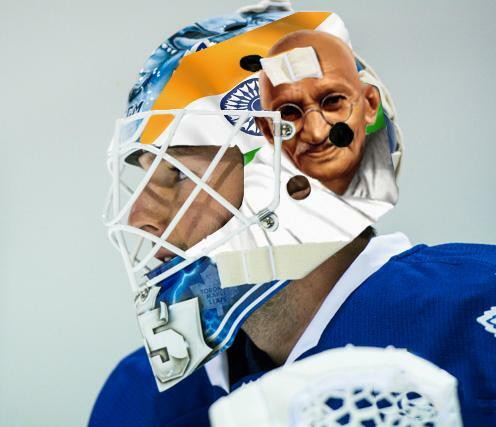 I might be able to add another one of my hockey heroes..."
"Gandhi was a beast on the ice. Always played hungry. Always hungry." Bernier hopes to unveil the new mask at training camp in a just few short weeks. Editor's note: Please welcome Rob Poirier (@RobFeature) to the blog! In addition to bRian, Rob is one of our new writers this season. Rob has previously written a guest post for our site that was a favourite amongst Habs fans.